Adlumia fungosa (Aiton) Britton, Sterns & Poggenb. Forests, rocky shores, and thickets; seems to do well on islands in the Great Lakes (some small ones as well as those mapped). Our only vine in this family, distinctive in the persistent spongy corolla of definitely united petals. 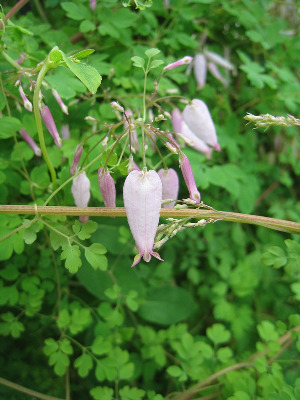 Occasionally cultivated as an ornamental, as well as native in forests. Often associated with some soil disturbance, this species occurs in small numbers in rocky woods and on cliffs and rocky shores, but may become briefly abundant after clearlng. MICHIGAN FLORA ONLINE. A. A. Reznicek, E. G. Voss, & B. S. Walters. February 2011. University of Michigan. Web. 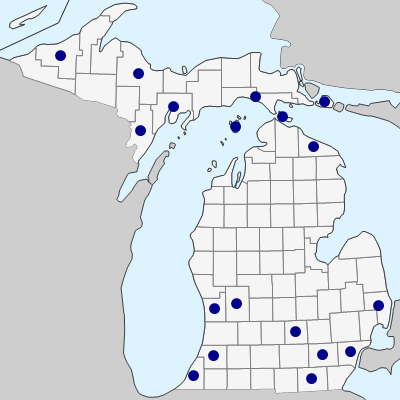 April 22, 2019. https://michiganflora.net/species.aspx?id=1882.